For the past few weeks I have worked on a new series. It’s unusual for the blog, but not for me. Since this website is formed by my interests, it is just a matter of time before Hermès appears more often than once a year. Some of my close friends would know that I collect silver, and Hermès pieces take up the bulk of it. Just in time for the Year of the Horse, I will start with the Galop Hermès GM. Being the perennial luxury fashion label for all things equestrian, there is no doubt that Hermès has a wide selection of jewelry reflecting their heritage. In their jewelry catalogue, one would uncover that the House has an entire section on Equestrian inspired designs (the other being Nautical). 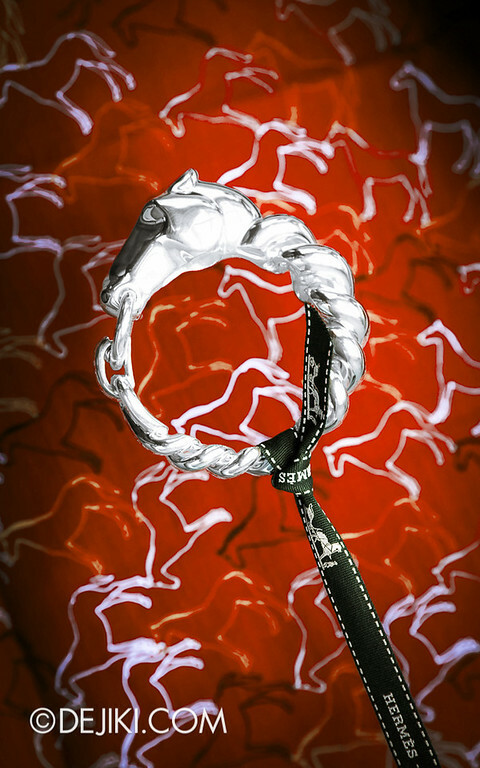 In the 1960s, the Tête de cheval bracelet was created. 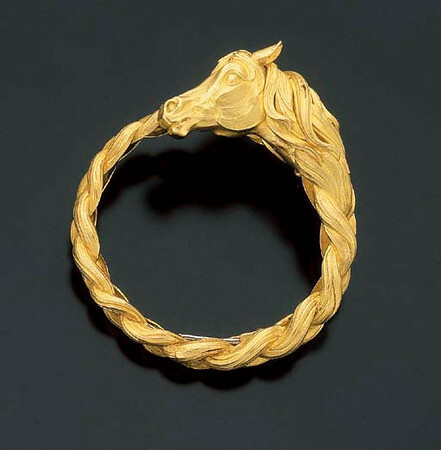 It is a gold bracelet which features a intricate horse head, with a sculpted mane that flows into a braid. Some 50 years later, the horse head was given new life in the Galop series of jewelry, as part of the Spring-Summer 2013 collection. Designed by Pierre Hardy, the Galop Hermès GM Bracelet combines both Equestrian and Nautical elements. 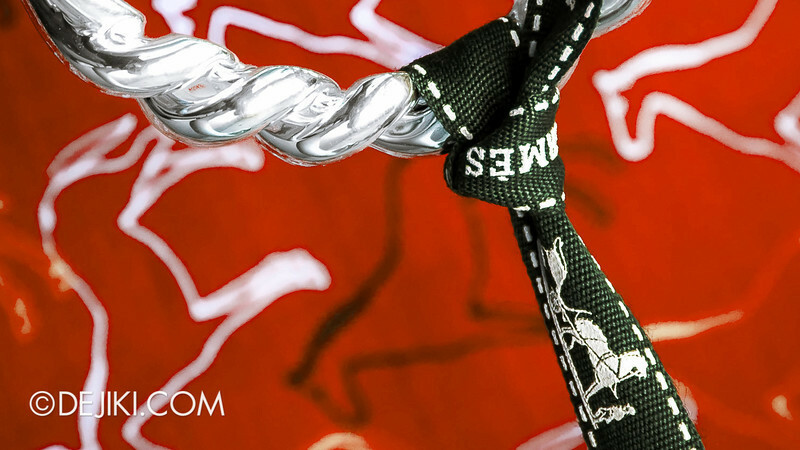 Sculpted in sterling silver, the horse’s mane curls into a twisting rope, which is tied to a ring bitten by the horse. A circle completed – an everlasting leap of a horse – captured in white. The horse head is the most eye-catching aspect and said to be challenging to sculpt. Like most other Hermès silver pieces, it is smooth and fluid. Finer details of the head, such as the eyes and nose, subtly appear with the play of light and shadow. Available in two sizes, the SH (Short) is close to the standard Collier de Chien in largest setting, while the LG (Long) has a few more rope links and should fit those with the larger Collier de Chien bracelet. Singapore has lags in the whirlwind world of Hermès, with the GM version of this bracelet arriving only in mid August 2013 – half a year later than in the West. The longer size was recently stocked as well. A simpler version (Galop Hermès PM) is available for a lot less. It features a smaller horse head on a simple bangle, without the dramatic rope twists. For the select few in the world, even more extravagant variations exist, such as one that is lightly embellished with diamonds. The ultimate Galop is the 18-carat Rose Gold version that is completely paved with diamonds (which probably costs more than a racehorse in Singapore), available at Hermès Harrods in London.